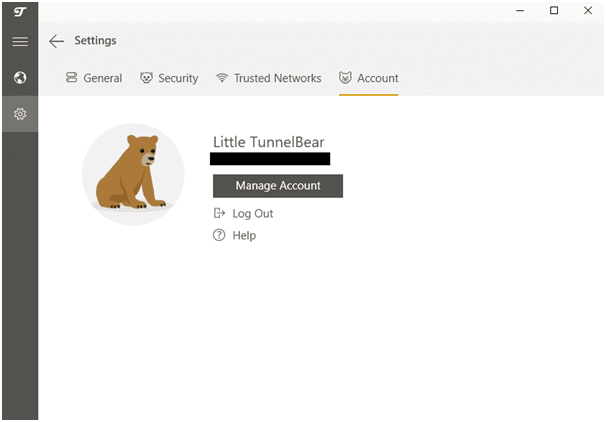 TunnelBear Review: Does This VPN Worth Bear-ing With? TunnelBear offers fast service and is easy to use. Given the number of functions it has, we give TunnelBear a strong 8.5/10 rating. There are certainly a few issues that cause this, so keep reading for a full review of the TunnelBear VPN service. TunnelBear VPN hosts servers in 20 countries. This allows users to hide their real IP address using the location of the chosen server. Thus, they can quickly and easily circumvent local censorship and other geographical restrictions. Users will need to invest in the paid plan to get access to each server in the list; for example, the servers in Australia are not available to users in the free trial. We tested TunnelBear using our specialized VPN testing servers. It allows us to get accurate results about the speed of a VPN. TunnelBear has established itself as one of the fastest VPNs and one of the top 5 when it comes to the speed of a VPN connection. Of course, users can face some slowdown when using a VPN. The further from the server you are located – the more slowdown you may experience. 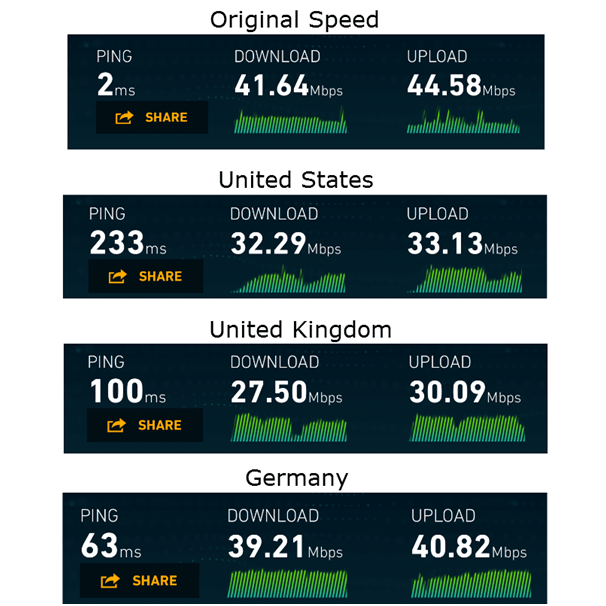 TunnelBear has an average download speed of about 28 Mbps, which is significantly higher than the average for VPN services. TunnelBear can outrun many other VPN providers on the market. The average connection speed of this VPN allows you to download and stream HD content without any problems. One of the reasons you can experience a slowdown is the GhostBear stealth mode, but we didn’t run into any trouble when using it. However, it doesn’t mean that you won’t. We also tested TunnelBear for DNS leaks through ipleak.net. We are pleased to announce that there was no leakage of IP or domain names system (DNS) when we used TunnelBear. There were no IPv4 or Web Real-Time Communication leaks as well. Unfortunately, we were unable to test for IPv6 leaks due to our ISP connection. There are some reports of IPv6 leaks but TunnelBear is constantly being updated to fix such issues. It also has a kill switch option called VigilantBear that can minimize the risk of leaks. TunnelBear works perfectly on Windows, Android, iOS, OS X, and even Linux. Linux users will need OpenVPN for the service to function properly. The iOS version of the app offers L2TP/IPsec encryption, which means that iOS users will also need OpenVPN connection The TunnelBear website has a guide to using the app on each platform. TunnelBear also has several browser extensions that allow users to integrate them directly into browsers. It has options for Chrome and Opera but unfortunately isn’t compatible with Firefox. The browser extension is a nice little feature that only works as a proxy, not as a complete VPN. It can only proxy the data within the browser and not in the other online activity. Like the main app, the browser extension works with Windows, Chrome OS, OS X, and Linux. Regarding protocols and encryption, TunnelBear offers access to two main VPN protocols with Windows, Android, and Mac OSX clients all using OpenVPN. IOS clients can use the Layer 2 Tunnelling Protocol (L2TP)/Internet Protocol Security (IPsec) or the Internet Key Exchange Version 2 (IKEv2) protocol. This means that anyone who wants to connect to iOS through OpenVPN must first download and use the free OpenVPN Connect software. The good news is that OpenVPN is very simple and easy to use that it should not be a big problem. Every version of TunnelBear, with the exception of iOS 8 and earlier versions, uses a powerful 256-bit Advanced Encryption Standard (AES) with SHA256 authentication. IOS 8 and earlier versions are encrypted through 128-bit AES with SHA-1 for data authentication. Although there have been some problems with IP leaks recently, TunnelBear is already working on fixes. Improvements prevent the leakage of IPv6 and IP. Here we turn to one of the main disadvantages of using TunnelBear. The service is based in Canada and it will not unlock the US Netflix, as well as it will not work with Netflix at all. This also applies to other streaming services. One of the main reasons people take a VPN is to access the entire content library using streaming services such as Netflix. Although there was a time when Netflix allowed this, recently it changed its policy and started blocking the VPN services. TunnelBear fell into the number of such services. If you want to freely access Netflix then you need to look for another VPN service. One of the main advantages of TunnelBear is that it is very simple and easy to use. This simplicity doesn’t mean that there are no additional functions. The service offers several special settings, for example, the ability to warn you when you connect to an unprotected Wi-Fi access point. Other services offer a similar function, but TunnelBear only warns you about really unprotected networks, such as those that have inadequate security or don’t require a password. Another great feature is the kill switch function. TunnelBear calls it VigilantBear. It protects you when your VPN connection is suddenly interrupted. This prevents unencrypted traffic from being leaked out to an ISP or other organization watching your Internet connection. A kill switch ensures that your privacy is totally protected and secure. Another important feature of TunnelBear is the GhostBear function. GhostBear could be considered a “stealth mode” service that works as a VPN obfuscation service. This disguises the traffic from OpenVPN so that users can break through firewalls, such as the Great Firewall of China and other monitoring programs. It is done using a proxy server, which prevents ISPs, governments, and businesses from discovering VPN encryption, making it a regular HTTPS traffic. GhostBear is a great feature for those who want to hide not only their IP but also the fact of using a VPN. The stealth mode will also prevent an ISP throttling data. The only problem with using GhostBear is that it theoretically can reduce the Internet speed more than a regular VPN. That’s why you should use it only when you really need it. You can get high speeds and stay safe using the usual OpenVPN User Datagram Protocol (UDP). Also, note that GhostBear isn’t available on iOS due to the fact that Apple restricts third-party app providers. TunnelBear also offers Trusted Network setting. This setting allows users to automatically connect to TunnelBear when accessing a network that isn’t listed in the Trusted Networks. It’s simple enough to “trust” a network. Just connect to it, open the settings for TunnelBear, and click on the “Add to Trusted Networks” button. If you aren’t sure which server is best for you, and all you want is to stay protected, then the Closest Tunnel function is for you. This button connects users directly to the nearest tunnel for fast and simple online security. TunnelBear stores several logs for a month, but this is a very minimal amount of data. The company is forced to do this to comply with Canadian laws and authorities. If TunnelBear is legally bound to comply with law enforcement over subpoenas, warrants, and other valid legal documents, then they must transmit the data. The only data they provide though is the information about how many VPN connections users made in a month, and how much data was transferred. TunnelBear will not collect the IP address that you connect to a VPN, as well as will not log what you do when using a VPN. You only need an email address to subscribe to the service but users can tweet out about TunnelBear for some free data. This means that TunnelBear may collect your Twitter account if you take them up on this offer. The main TunnelBear offices are located at 141 Bathurst Street, Suite 101 in Toronto. The CEO of the company is Ryan Dochuk, and information on the rest of the team is available on the company website. Although this policy sounds great – and this is so – there is one thing that needs to be noted. TunnelBear collects information about the total data used, which means that they can detect when a user violates their rules that prohibit the use of TunnelBear to load P2P. Given that VPNs are used to stream on services such as Netflix, using a large amount of data is not necessarily a sign of torrenting. Nevertheless, it’s better to avoid using the service for torrenting, as requested by TunnelBear. This is because the service may not store data logs, but they can monitor the use of server traffic for P2P and ban accounts before receiving DMCA warnings. If you are looking for a torrent via VPN, you should consider another service. The fact that TunnelBear supports such minimal records should assure users that they can freely use the VPN for their needs. Even if the authorities serve TunnelBear with the warrant, they will not have much information to transfer. A support system is an important part of any service. Users need someone to contact if they have questions. The good news is that TunnelBear is equipped with a special help page accessible through any page on the website. The help page contains information about status updates, accounts and payments, getting started with the service, help with the browser extension, help for the Windows app, the Mac OS X app, the iOS app, and the Android app. Use the search function to find a specific article and solution to your problem. Anyone who cannot find the answer on the TunnelBear help page can directly contact the support team. Unfortunately, there is no live chat function, which means that you have to use the contact form and wait for a response rather than getting one immediately. Everyone has an opportunity to contact TunnelBear with questions about their service. We have sent a question about encryption to their support staff in order to test it and see how the service has changed. We received an automatic email message telling us to expect a response within 24 hours – which it did – but the answer was not very clear, and we had to ask for additional verification. Despite this, the support staff was friendly, knowledgeable, and ready to help. Perhaps this is not the best support service, but it is still doing its job. TunnelBear offers three payment plans for users: Little, Giant, and Grizzly. The Little plan is a free trial version. At the moment we are going to focus on paid plans, including how users can pay and tell in more detail about the return policy. The Giant plan is the monthly plan. Giant subscribers can get an unlimited amount of data and all the functions and services of TunnelBear for $9.99 per month. The Grizzly plan offers the best value for money, as well as the most popular payment plan. This option gives users access to all TunnelBear services for only $4.16 per month (with annual payments of $49.88). Both paid plans provide the same level of service and unlimited access to servers. There is still bad news, as TunnelBear does not provide a return policy. The reason for this is that they have such a great free trial program. Users are able to test their services, and therefore they don’t feel a need to provide refunds. This is why anyone interested in the service should try the Little TunnelBear plan before making a purchase. The Little TunnelBear plan can be obtained by specifying only your email address. Of course, there are some limitations to the free trial. The first limit covers data. Little TunnelBear users are limited to only 500MB of data per month. This isn’t enough to really use the service for significant tasks such as secure streaming and movie downloads. It also has a restriction on access servers, since free users are not able to access Australian servers. They still have access to 19 locations out of 20 though, which isn’t bad at all. The free version of TunnelBear has some features. For a start, it’s a great way to test the service and understand whether it is worth investing in a full account. Given that there are no refunds, this is an important step for everyone interested in the service. It’s also a good idea for people living in conflict zones or in areas where there is serious censorship. 500MB is more than enough to access news websites and, if necessary, perform tasks that require a lot of resources. It’s also a great deal for people who don’t plan to use their VPN too much. Why pay for something that you don’t need? You can not only install the TunnelBear app on as many devices as you want, but you can also use it on multiple devices at the same time. TunnelBear allows users to connect up to five devices to their services through one account. TunnelBear clearly takes care of its users and offers fantastic customer support. Most of the information you might need can be found directly through the website, and the customer service team will respond within 24 hours for questions not covered in the FAQs. An important aspect of the VPN service is the choice. Providing more than 20 different countries (with the exception of Australia for a free trial) gives users a great choice when it comes to choosing a country to connect. TunnelBear uses only the most powerful encryption tools. They don’t use outdated encryption protocols so users can be sure their data remain confidential and anonymous. Add to the service GhostBear and you have an incredible encryption service. A great aspect of TunnelBear is that they collect almost no logs about how users access the service. Any collected logs are intended solely for legal purposes. They also don’t collect identifiable information outside of an email address and Twitter account (which is optional). Even if they are contacted by the authorities, they’ll have almost no information about you to surrender it. GhostBear is an excellent addition for people living in areas where VPN traffic is controlled and throttled. It hides VPN traffic to prevent any throttling and monitoring. This can slow the connection even further, but the stealth level compensates for this. A VPN can protect you only as long as it is active. If the server goes down or something similar happens, then your private browsing information can leak out. The VigilantBear option automatically disconnects the service if something happens with the Internet connection and launches it back after the connection has been re-secured, which means that personal data never leaks. TunnelBear comes with browser extensions for Chrome and Opera. Sometimes you don’t need to encrypt everything you do on the Internet, you only want to encrypt traffic from a specific browser. These extensions do just that and allow anonymous browsing, still using your regular connection for data-intensive tasks such as VOIP services. Users can download and run TunnelBear on almost any device or operating system. TunnelBear recently adopted Linux support as well. You may need to download the third-party OpenVPN app and you’ll have the option to encrypt your connection no matter what. Using a VPN is sure to reduce connection speeds. It’s a natural part of the service. The good news is that TunnelBear remains fast and powerful when connected. There’s some slow down, but you can still enjoy high-speed downloading and uploading. TunnelBear is constantly updated to be faster, securer, and solve potential problems. Given that the company is based in Canada there are some limitations on what the service can be used for. Canada has strict Internet laws. Therefore, TunnelBear asks its clients not to use their service for torrenting and other P2P downloading. Although you can technically do this with the help of a service, you may be banned for this. If you want to use the VPN for downloading then check other services. The customer support is a little bit limited. The inability to use live chat is a big disappointment if you need immediate support. This is normal if you can wait but you will not get much choice if the problem isn’t covered by the main support page. Having access to the American Netflix library is a big reason why people invest in VPN services. There’s no doubt that this library is much broader. Netflix began blocking traffic from the VPN, and TunnelBear could not bypass it, like other services. Once again, if you need to access US Netflix, you will need a different VPN service. 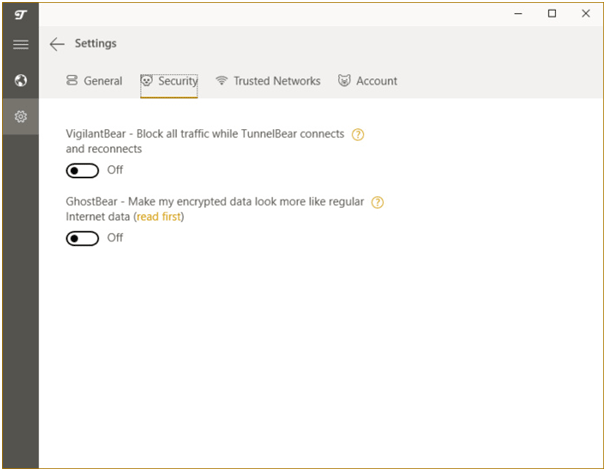 TunnelBear is an excellent VPN service and the speeds they offer should be enough sufficient for most people using VPN. However, you’re unlucky with this service if you want to access USA Netflix and use BitTorrent. Users who care about their privacy may be concerned that TunnelBear collects some data, but this is general information and it doesn’t include personal browsing activity. The third-party audits show that the service can be trusted with your information at least. Give TunnelBear a try with the free service and see if it’s suitable for you or not.